ALD Amaze has released a small, yet stealthy pod vaporizer kit thatï¾’s perfect for vapers that are looking for an easy to use and stealthy vaporizer. There are a number of exciting new pod systems being released and the Mango Pod Kit by ALD Amaze has new vapers very excited. The Mango Pod Kit is ideal for vapers that love to take those mouth to lung hits and vape high nicotine e-liquids and SaltNic e-liquids. The Mango Pod Kit is shaped just like a mango, small, compact and extremely stealthy. If youï¾’re looking for a portable vaporizer that fits easily into your pocket or bag, youï¾’ll be interested in the Mango Pod Kit. The Mango Pod Kitï¾’s shape makes it comfortable to hold, and it fits easily into the palm of your hand while youï¾’re vaping. One cool feature of the Mango Pod Kit is that it doesnï¾’t even have a firing button. You just inhale, and the vaporizer will be activated. This feature makes the Mango Pod Kit even better for slipping into your pocket. Youï¾’ll be surprised to know that the Mango Pod Kit has a large 380 mAh battery capacity, perfect for vapers on the go. 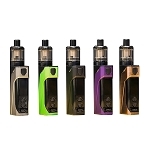 The Mango Pod Kit has an internal coil system which offers vapers a 0.8 ohms resistance and a convenient 2 ml tank. It doesnï¾’t matter what e-liquid or e-juice you love, youï¾’ll be happily vaping away all day with the Mango Pod Kit! 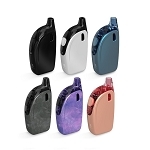 An exciting little vaporizer that has blown away many new and experienced vapers. 3 points worth $3 will be earned when you buy this item.